The issue of whether vegetarians are healthier than people who eat meat is a complicated one. Many people who turn vegetarian do so for health reasons or to follow their doctors' recommendations. Others do so for ethical reasons, with health benefits being an afterthought. This doesn't mean people in this second group won't reap the benefits of becoming a vegetarian. People who eat meat are more likely to have higher cholesterol because cholesterol is only present in animal-based foods, including meat, eggs and dairy products. High cholesterol can increase your chances of developing heart disease, which can, of course, shorten your life span. According to a 2006 article in "Life Extension" magazine, eating meat can also increase the risk of developing certain cancers, such as colon cancer, as well as kidney stones and gallstones. A 2003 report published in the "American Journal of Clinical Nutrition" analyzed six different studies to try to establish whether vegetarians live longer. The report found that low meat consumption decreases risk of death and increases life expectancy. In fact, research shows that reducing meat consumption can increase your life span by 3.6 years. The same report showed that societies with plant-based diets are more likely to live past 70 years of age. Some experts believe the difference between the life span of meat-eaters and vegetarians is not actually based on food choice. 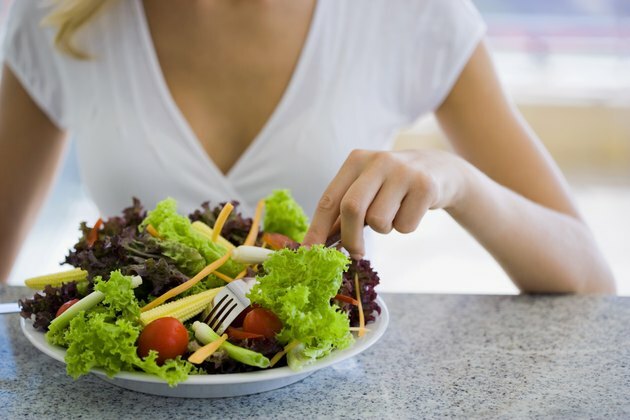 According to research by Janice Hermann, a registered dietitian and nutrition specialist for Oklahoma State University, many vegetarians maintain a healthier lifestyle than meat-eaters. For example, many vegetarians also avoid smoking and cut down on alcohol because they believe in healthier living. They're also likely to be active and maintain a healthy weight. All of these factors can contribute to a longer life span. Just because you're a vegetarian doesn't mean you're eating healthy. It's possible to be a vegetarian and survive on french fries, sweets and high-fat dairy products. An unhealthy diet will lead to health problems, regardless of whether it contains meat or not. Just being a vegetarian doesn't mean you'll have a longer, healthier life. To get the benefits of a meat-free diet, you will need to focus on eating lots of fruits and vegetables, as well as whole grains.